A sweeping new history of how climate change and disease helped bring down the Roman Empire Here is the monumental retelling of one of the most consequential chapters of human history: the fall of the Roman Empire. The Fate of Rome is the first book to examine the catastrophic role that climate change and infectious diseases played in the collapse of Rome's power--a story of nature's triumph over human ambition. Interweaving a grand historical narrative with cutting-edge climate science and genetic discoveries, Kyle Harper traces how the fate of Rome was decided not just by emperors, soldiers, and barbarians but also by volcanic eruptions, solar cycles, climate instability, and devastating viruses and bacteria. He takes readers from Rome's pinnacle in the second century, when the empire seemed an invincible superpower, to its unraveling by the seventh century, when Rome was politically fragmented and materially depleted. 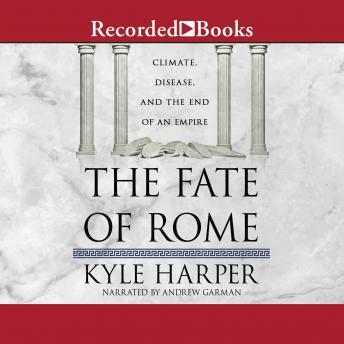 Harper describes how the Romans were resilient in the face of enormous environmental stress, until the besieged empire could no longer withstand the combined challenges of a "little ice age" and recurrent outbreaks of bubonic plague. A poignant reflection on humanity's intimate relationship with the environment, The Fate of Rome provides a sweeping account of how one of history's greatest civilizations encountered, endured, yet ultimately succumbed to the cumulative burden of nature's violence. The example of Rome is a timely reminder that climate change and germ evolution have shaped the world we inhabit--in ways that are surprising and profound. Author bio: Kyle Harper is professor of classics and letters and senior vice president and provost at the University of Oklahoma. He is the author of Slavery in the Late Roman World, AD 275-425 and From Shame to Sin: The Christian Transformation of Sexual Morality in Late Antiquity. He lives in Norman, Oklahoma.